Was tracing some skylines as part of a website layout template mockup and decided to do something else with them. Palm tree stock from Stock Exchange. 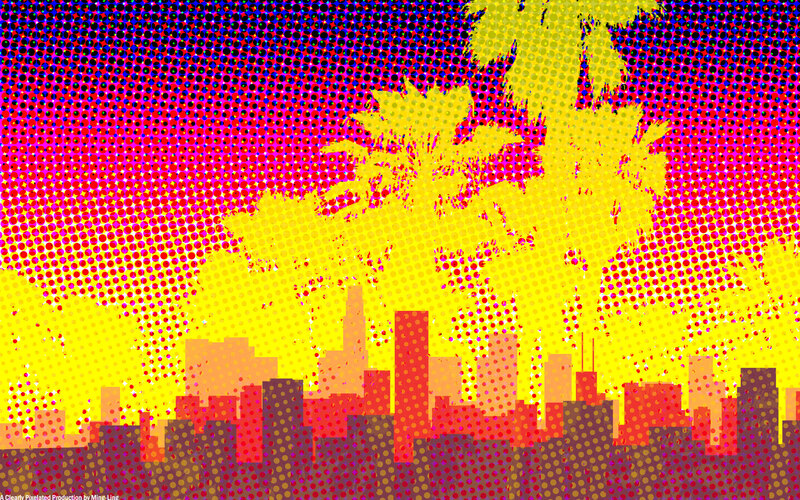 Lots and lots of half-tone bubble patterns to make it that pop art style and sunset colors because LA is all about overstimulation and oversaturation and bright shiny colors and artifice. Sorry, no additional resolutions available. The crop tool is your friend. I'm really, really, REALLY disliking the way in which you've used the half tone filter. It looks like you've made the wall, and just decided to slap the filter on as some sort of last resort, without even attempting to make it fit in with the rest of the composition. Sorry, but for me thats really just killed the whole piece. owwwww halftone filter. frankly this looked awesome from the thumbnail but it's ow-ing me in full view. the filter kind of.. takes away from the shape of the palm trees and the overall being able to look at it :/ fun vector as always, though. oooooo, very awesome wall - I love the feeling of the pop art - definitely captured LA's feeling. Nice work! It is very nice and the colours are bright. I like it. The thumbnail looked interesting, but the full size version is a killer for the eyes. Maybe it would look better with less bright colours? Dunno. Wow...a single wallpaper that brings back all the memories and style of the 80's in one glaringly-bright omage to neon glitz. It's beautiful. Okay, maybe not "beautiful" in the traditional sense, but for doing what it does in the way it does it...wow. I'm down right impressed. Maybe that's not quite the effect you were going for, but that's what it does to me. Crop tool? Bah! The widescreen monitor is /my/ friend!